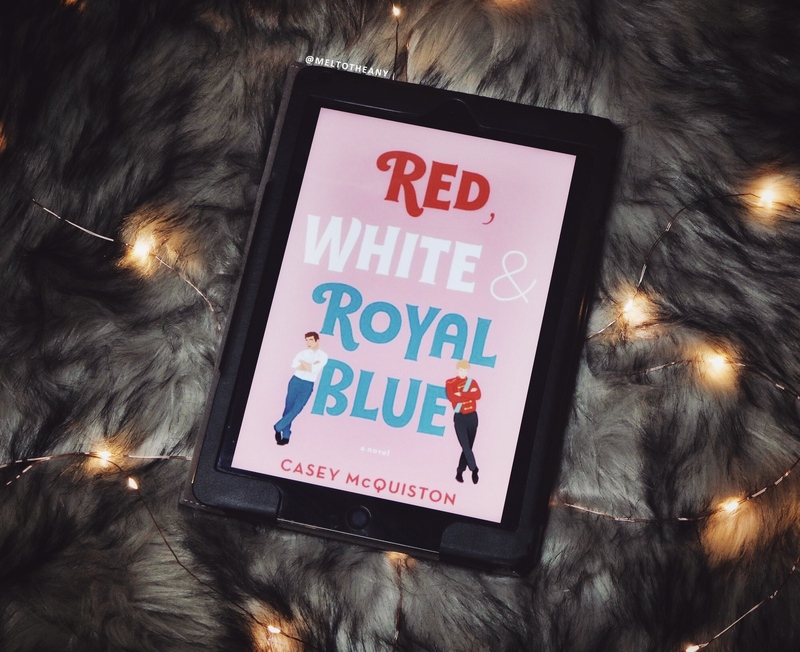 I honestly do not think that any book has made me happier than Red, White & Royal Blue, ever. I laughed, I swooned, I cried, but, most importantly, I finished the last page and felt such a powerful amount of hope that transcends any amount of words that I could possibly string together for this review. This is easily the best debut novel I’ve ever read, and I wouldn’t be surprised in the slightest if it ends up being my favorite book of the entire year. First off, in this story, the characters are living in a world where the President of the United States is a democratic woman who was elected after Obama, and her 2020 reelection is quickly approaching. And I just need to take a minute to… *cries forever*! But this book really focuses on two young men, who happen to be very much in the media’s spotlight 24/7, because of the families they were born into. Oh, and one of them happens to be the First Son of the President, and up until this point he thought he was straight, that is until he finally is forced to spend time with his arch nemesis. And I’ll be damned, but this book made me simultaneously believe in love and believe in America. ➽ Alexander Gabriel Claremont-Diaz – The First Son, who is quickly realizing that he is bisexual, but slowly coming out to those he feels safe with. Alex is also biracial (Mexican and white) and (thanks to my beautiful friend Alienor) confirmed to have ADHD! ➽ Henry George Edward James Fox-Mountchristen-Windsor – A Prince of England, who is closeted gay to many in his family (and to all media), because he constantly feels the weight of the expectations placed on him by his family and his country. Alex has followed Henry and his fame long before his mother became president. But at the start of this novel, both men officially meet, but quickly get into a very messy predicament at a royal wedding they were both attending, which ends up being a PR nightmare for both countries, but especially for Alex’s mom, who is up for reelection. So, they are both kind of forced to fake a friendship to appease the press to save face. But a fake friendship quickly turns to a romance, that leaves both men questioning what they are willing to risk, while the press is always watching. I also wanted to make sure that I stated in my review that the author is queer (I believe they ID as bisexual, like Alex!) And even though Alex and Henry are obviously queer in their m/m relationship, this book also has such a beautiful and full cast of diverse side characters! I’m completely willing to give my life for June, Nora, Pez, and Bea, right this very second. Like, I absolutely loved the side characters in this book. Also, you all know that I am always here for strong sibling relationships, and this book has that in spades! Alex’s family in general was everything to me; both of his parents being so supportive and always putting him (and his pace) first really meant a lot to me and makes me so soft just thinking about it. Seriously, this book is found family and blood family goals. The banter and one-liners were perfection. This author completely understands what it is like to speak and text in your twenties, and they have mastered the craft to perfection. I was either cackling like a banshee or clutching my pearls with heart eyes during all of Alex and Henry’s exchanges. Also, since there is an ocean in-between these two, they correspond a lot of the time through emails, all of which added five years to my life. Speaking of those emails, the romance in this is just truly a tier above the rest! The dynamic that Henry and Alex are forced into, and then the new dynamics they are forced to overcome, makes for something that you can’t help but root for with everything in your soul. Also, they are truly polar opposites with their personalities, but seeing them together truly feels like you are witnessing soulmates interact. I hate to say this but, your OTP could never. And obviously because of the setup of this novel, this book does not shy away from US politics, and you should for sure know that going in. But the most tears I shed in this book was when Alex talked about what he felt like to be a biracial kid, and how America truly is a melting pot of immigrants and how that is something beautiful, and should be celebrated, not shamed and something that people consider to be a crime. This is a book about two men, both in their early- twenties, discovering what they want for their lives and for their countries. Both for themselves and together. In a world that is cruelly unaccepting to anyone who isn’t white and straight, or who are just deemed different. They find friendship, they find love, and they find their voices. And to this Filipino American, pansexual, whose grandparents are both immigrants, who a lot of times really struggles to find their own voice, it meant the world to me. I’ll carry this book with me forever and always. Overall, this book was just everything I’ve ever wanted. Put your library holds and preorders in now, because I know that so many readers are not only going to fall in love with this tale, but it is going to be one of their favorites for the rest of their lives. I promise you, it is truly that good, and this truly feels like a once in a lifetime book. Casey McQuiston has created something that is going to mean so much to so many readers, and this book is going to bring so much joy to our much-needed world. I’m just forever thankful that I was able to escape into it for a little while, while doing everything I can to make my country’s 2020 and on just as hopeful. Content and Trigger Warnings for homophobia (always in a negative light), talk of racism in media, anxiety depiction, talk of cancer (pancreatic) in the past, talk of past loss of a loved one, talk of past drug use, talk of attempted sexual assault (very briefly) in the past from a very minor side character, and (in my opinion) outing. Also, this is a New Adult novel, so there are many sexual scenes throughout this book, even though they are fade to black for the most part! ❤ I also gush about this in my February Wrap Up on BookTube! Thanks for the review, I’ll have to check this out. Do you have any other book recommendations for spring? This sounds so fluffy and adorable and I absolutely cannot wait to read it! Also now I’m so excited that one of the characters is biracial like me and need to read it even more!! I hope I can read it soon! Ugh this is RIGHT up my alley! Love your gushing review of it! I hope to pick it up soon it sounds so freaking cute and lovely!! !